In September, D.C. Comics' lineup of monthly titles all will restart at issue No. 1, some delivering major changes to their continuities, all of them rebooting—or relaunching, as Jim Lee gently insists it be called. None of this will affect the video game bearing the D.C. name, nor should it. "It's the platonic ideal," Lee, the co-publisher of D.C. Comics, says of the history represented in D.C. Universe Online, which in two months will be starkly different from that of the comics. "It's the ideal version of the D.C. Universe as everyone mostly knows it, through all the different adaptations of our characters." But the game still should make a few overtures to the D.C. Universe reboot—sorry, relaunch—coming in September, Lee told Kotaku at Comic-Con 2011. "I think we're going to be able to tie into the relaunch in subtle ways in the game going forward," Lee told Kotaku, "Maybe in terms of items you acquire in the game that might give players the ability to look like some of the new costumes. "But there's no realistic way to go in and reskin all of these models that were already made," Lee said. Not that he, Geoff Johns (the D.C. chief creative officer) or anyone with D.C. Universe Online would want to, if they could. Superhero video games, like superhero movies, are not direct reflections of the current events in publishing, nor are they expected to be. Thus, even though D.C. Comics had made up its mind to do the relaunch just after the time D.C. Universe Online was releasing, Lee didn't see it as making moot or obsolete the stories told within the game. I suggested that DCUO will exist as a kind of living repository of the publisher's old continuities, a hall of fame for the events leading up to the relaunch. Lee agreed. "It is [a hall of fame] in many ways. You can explore the DC Universe not just on a linear path, but also in terms of eras, because you see all these different incarnations of the characters," he said. Indeed, not only does the modern Flash appear in the game, so does Jay Garrick, the Golden Age Flash. "I think that was a lot of the decision-making, the creative decisions that had to be made [for D.C. Universe Online] during that five year period," Lee said. "Which version of Cyborg do we use, from the kids' cartoon, the Teen Titans, or from the first appearance of the character through comic books, or the latest version in the comic books. Same with Batman." Not that Lee or D.C. wanted Sony Online Entertainment to be caught off guard by their publishing plans. Once the decision was made, they brought the video game's management on board, he said. "The origins of DC 52 [the code-name for the relaunch] were like last October, with a writer's summit," Lee said. "We probably didn't pull the trigger on it until about February or March. But we still didn't know the depth and breadth of the changes, that was just the decision was mad. So, hey we're going to do a big event and it's going to be in September. "But once we had an idea of what it would be, we actually sent some of the artwork and had a frank discussion with SOE about what we were doing," Lee said. 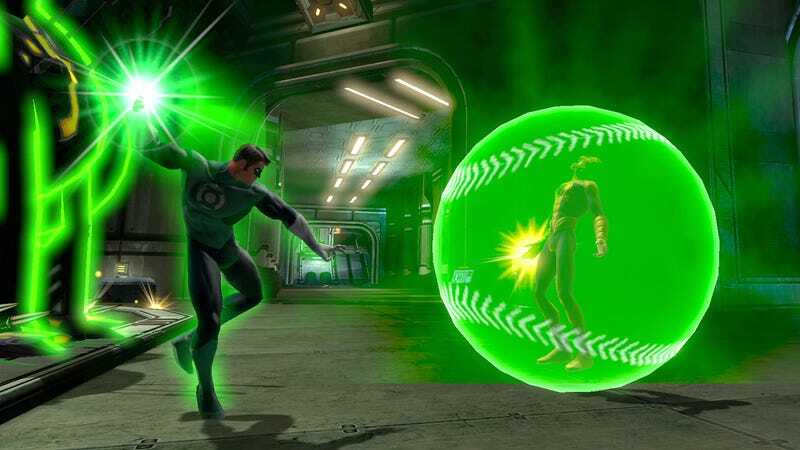 While Lee may not be involved day-to-day in the development and support of the game, he remains current with its major plans, having recently played a build of the "Fight for the Light" expansion that will deliver Green Lantern's light powers to the game. However, he seemed pretty certain when he spoke for DCUO reflecting some of the D.C. Universe relaunch through costume items and other character add-ons. When I pressed him as to whether we'd be seeing new DCUO missions or alerts tied in with the relaunch, Lee joked that the publicist assigned to the interview was kicking him underneath the table. "I wouldn't want to promise anything but we have been discussing it for a while," he said, "and having items in the game that players can get, that give them the new DC look would be the easiest to implement. And probably the most fun, actually."